Have you ever considered how vital your eyesight is when playing tennis? Top Wimbledon players, such as Rafael Nadal and Venus Williams, have far better visual abilities than the average person either naturally or with extra training. In her prime, the bespectacled Martina Navratilova would use special eye training equipment every day. Running around a tennis court can cause the eye to dry out and eye protection may be necessary. Large soft contact lenses of low water content or silicon hydrogel material to minimise evaporation are the contact lenses of choice. There may also be a need for protection against dust and dirt on a windy day and UV protection is considered a priority. WHAT IS A SPORTS VISION ASSESSMENT? A detailed eye examination is recommended as a first step, which will indicate strengths and weaknesses in visual tasks related to your ability to play tennis. A sports vision assessment involves further investigation of various visual skills to highlight any difficulties and recommendations are then made in a detailed sports vision report. These visual deficiencies can often be improved by the use of spectacles or contact lenses and sometimes the use of a training programme involving the use of eye exercises. Andy Roddick holds the fastest serve record at 155 mph (249.4 km/h) during a Davis Cup semi-final match against Vladimir Voltchkov in 2004. Roddick held the world record for the fastest serve at 155 mph between 2004 and 2011 until it was beaten by Ivo Karlovic at 156 mph in March 2011. Previously, the fastest tennis ball speed on record, is a serve at 149 miles per hour achieved at high altitude in Indian Wells, USA by Greg Rusedski which was equalled by Andy Roddick at Wimbledon in 2003. Taylor Dent served the fastest serve at Wimbledon on 23rd June 2010 at a speed of 148 mph. William (Bill) Tatem Tilden, in 1931, is often quoted as having served the world's fastest tennis ball with a speed of 163.6 mph, although this was before accurate electronic measuements were available. The fastest serve by a woman was by Venus Williams with a speed of 129 mph on 5th July 2008 at Wimbledon in the Ladies' final playing against her sister Serena. It should be borne in mind that the speeds recorded are taken at the point of impact of ball on racket. By the time the ball reaches the opponent on the other side of the net a serve of 130 mph has slowed to around 50 mph on a fast grass court such as at Wimbledon. Accuracy of vision or how well you can see the flight of the ball during a rally. A refractive vision assessment will determine if any optical correction is required. Best vision is usually achieved using contact lenses but special spectacles can be of value if a progressive lens (which corrects for far and near) is needed. Contact lenses are better in rain but wrap around spectacles can protect against strong breezes. 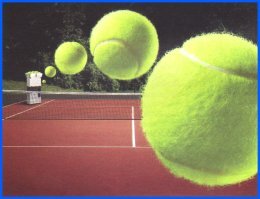 Depth perception is also known as stereoscopic vision and is the ability of the eyes to judge distances such as that between the racket and the ball. Your assessment can be accurate only if both eyes are controlled precisely by the eye muscles. This is a visual ability which may be able to be improved if it is found to be below normal. An assessment can be carried out in the Practice to determine the stereoscopic acuity and exercises advised for its improvement. The ability to pick out the ball against the background of the trees or a crowd in dull or hazy conditions can usually be improved by the use of coloured filters. The colour which is best for you will need to be determined during a sports vision assessment. Your eyes need to be able to focus from ball to racket and the accuracy of this focusing ability may be affected by tiredness especially if there is a problem using the two eyes together. This ability can be measured in the Practice and you can do exercises at home if it is found to be deficient. You need to be aware of the position of the white lines on the court while you are looking at the ball. Increasing your peripheral awareness can improve concentration and balance and this can be often be improved by the use of quite simple exercises which can be done at home. Although not purely visual, this skill is essential if you are to be able to make perfect contact with the racket on the ball. The visual imput has to be translated into spatial location by the brain which triggers the various muscles of the body to move in such a way as to enable you to connect racket with ball.